Warm Remembrance – Pottery, paintings, photography, and more! Yesterday’s snow has given way to blue skies and freezing temperatures. Typically, the temperatures would be no problem for me on a ‘snow day’ tucked inside my studio room–but, the heat in the house is broken. We have been without heat for more than twenty-four hours. So, with my ‘recess’ hat, down vest, and several pairs of socks on I find myself painting. 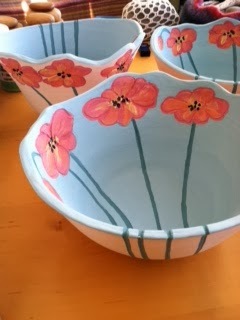 Painting poppies! The warm reds and oranges along with the act of painting serve as a beautiful distraction from the chilly air. As I was finishing up with my poppies I recalled that poppies sometimes signify ‘remembrance’–and I found that today I wish to remember all those for whom a lack of heat is a daily reality. I am grateful for the reminder.